The Skills Passport from its inception in 2008 was originally intended to provide a stepping stone towards professional accreditation at the start of, or prior to a career(i.e. membership of the Institute for Archaeology (IfA)); a means of recognising personal skill gaps; and a convenient way to log continual professional development (CPD) and creating Personal Development Plans (PDP). 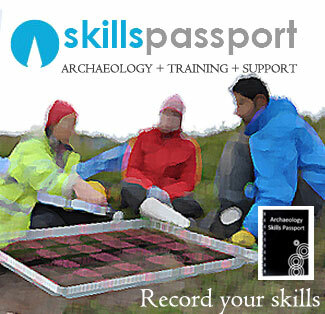 The Passport contains a record of basic competences gained including core, secondary and tertiary skills, and in conjunction with the website, acts as an invaluable guide to career pathways (by highlighting skills required for archaeological occupations). The passport also helps potential employers make a more informed assessment of a job applicant’s skills. Why is the Skills Passport needed and how it will work? CVs and covering letters are well known for their over reliance on self-assessment and self- aggrandisement. As an employer you might only find out if a person is actually competent or not once into the job. Therefore, the Passport would act as a much more reliable record of the skillset attained by a job applicant. The Passport should prove invaluable to its owner, who will quickly be able to comprehend from the information provided, what it is they need to learn in order to gain employment within the profession. There is already a complex National Occupational Standards (NOS) matrix that looks at skills, but is extremely difficult to cross relate and define particular elements. The Skills Passport is specific and uncluttered and each skill is standardised requiring no formal ruling and validation, as this is carried out as a self-regulatory system. A skill is gained, dated and signed off by named individuals, who by doing this are confirming the passport holder’s competence. It requires a simple test on each practical skill and asks “can you carry out the task without assistance or not”? There are Core Skills which are the basic requirements for all field archaeologists, Secondary Skills, that are recommended, and Tertiary Skills, which, in reality extend into any number of potential specialisms from Lithic Analysis to Heritage Law. The holder must demonstrate the ability to set up correctly and take appropriate measurements with no instruction from the trainer. If this is achieved, the trainer can then initial and date the skill. There is room to repeat this skill training on several dates, thus proving ongoing competence. Novice: Able to carry out the specified task under supervision. Competent: Able to carry out the specific task with limited supervision. After completing this task 4 times (usually within the space of 2 years) you can be confident that you are able to carry out this task with some degree of competence. In addition, a prospective employer can crucially see concrete evidence ( including who signed you off) that you can carry out this task. This Passport is for You to begin your career in archaeology, and the logging of skills and training will see you in good stead for membership of a professional organisation such as the Institute for Archaeology (IfA). You may wish to continue your skill training by moving to the CPD Training Passport.